Sailing is a great sport, unparalleled for teaching kid’s independence and self-reliance; they match themselves against the elements in a racing machine without an adult at the controls! TASC is your local sailing club, run and maintained by its members. 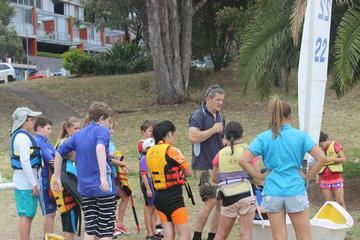 The club has a long, proud history of promoting the sport of sailing and has been home to Senior and Junior champions. The sailing season runs from September to April with a break at Christmas and each year the club runs a Learn to Sail course from October to December for children 8 years and older who have an interest in sailing but little or no experience. This course is aimed at kids who think sailing is for them and want the best possible to the sport. First half season 1– Learn to Sail, an 8 session course with a Yachting Australia qualified Instructor and Assistants to achieve a skill level of at least “Basic Skills Part 1” as defined by Yachting Australia (YA). Students will learn to be confident on the water under sail. Participation includes full membership of Yachting Australia, which provides benefits such as personal injury insurance. Second half of season 1– The opportunity to join the club at preferential rates, inclusive of boat use and instruction and continue to develop Basic Skills to a level of confidence leading up to learning the basics of dinghy racing. Second season; Come back after your first winter off the water to an introduction to intermediate sailing and racing with the clubs growing fleet of Sabots, although we encourage boat ownership it is not essential and there one of the Club’s Sabot’s can be hired at preferential rates for an introductory season. It is our passion to promote sailing in Toronto, to introduce children and their families to this great sport and welcome them to our club. Participants must be able to swim 50 metres and agree to comply with the expectations and commitments required of junior sailors. Follow the links to Learn to Sail application form for the current season.